I was staring at what my writing buddies and I deemed the best rejection you could ever receive. It was from a well-known publisher who loved my voice, but deemed my story unsuitable for what they were publishing. I flattered and frustrated, ready to throw in the towel because I was so close! But the TRM girls stopped me. They encouraged me to submit to some more publishers and take a break for a while, to drop everything and go to Ireland. Then when I got home, I would hopefully come back to a nice surprise. So I did just that and when I was sure that I’d done everything I could, I packed my bags and headed off to Ireland. After five amazing weeks where I gathered so much inspiration to continue working on my stories, I returned home, jetlagged but ready for action. The next three days were spent getting back into the swing of things when I got an email from my publisher, Secret Cravings Publishing, asking for a few details. My heart was in my mouth and I knew what the email meant. They were going to offer me a publishing contract! Excited, I sent an email back right and then an email to the rest of TRM. Three days home and I’d already heard some good news! And from there it was all go. I sent back the contract, I emailed off the blurb and cover art questionnaire and after a few days wait, announced it to the world. I was finally going to be an author! And the great thing is, whilst I’m busy and run off my feet at the moment organizing my release, I’m smiling the whole way. It’s both a terrifying and exhilarating experience. The first edits, the cover reveal, the first review… They are all things you, as an author, dread and can’t wait for. So, I think that’s my ‘call’ story. I didn’t have a smooth ride to publication, though I certainly learnt a lot and am more than happy to have found a home for my story. The Rocky Road to publication is a long road for some, but in the end, you think of it as fate. Or at least, I know that my story wouldn’t be the story it is today if I had thrown in the towel when my doubts became too much. 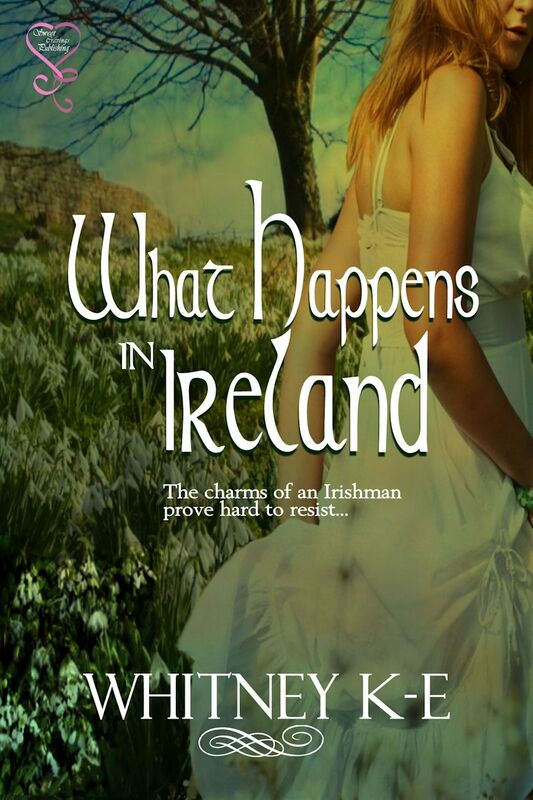 What Happens in Ireland releases on the 26th of this month! You can join in the celebration of Whitney’s release via her Release day Facebook event and even win yourself some prizes including copies of her novel! Ever wondered what happens in Ireland? When Australian, Kate Barrow, meets a handsome Irishman in a Dublin bar, she has no idea that he’s about to turn her world upside-down and inside-out. In Ireland to take on a position on a thoroughbred stud, Kate is shocked when her manager-in-co reveals himself to be the same man she’d met in Dublin. Jack is drawn to Kate. The problem is, she won't have him. But Jack has always loved a challenge and the intriguing woman from Oz is one he cannot resist. Harbouring the sting of another man’s betrayal, Kate is certain she wants nothing to do with love and nothing to do with Jack O’Reilly. But when naked torsos, Mother Nature and dysfunctional umbrellas start plotting against her resolve, she realizes the charms of an Irishman are going to be hard to resist. Hailing from NSW, Australia, Whitney isn’t sure what it is about Ireland that drew her to setting her novels there. A lover of horses, romance and rural life, Whitney can’t help but include all these aspect in her novels, bringing readers stories from the emerald isle to the sunburnt country. A coffee addict and a romance junky, Whitney loves to connect with her readers and fellow addicts on Facebook, Goodreads and Twitter. 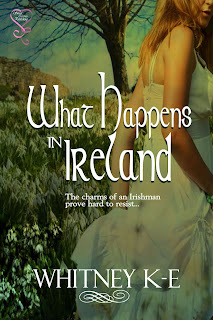 What Happens in Ireland releases on the 26th of April, so prepare yourself to be charmed by her story and by her characters. Well done, Whitney. I'm in awe of what you've achieved at such a young age. Congratulations Whitney. So proud of you honey. Whitney, that is a wonderful story, After meeting you at RWA conf last year, I am so very happy you are on your way now. You'll still grab one of those big publisher deals one day, I'm sure, and it doesn't matter where you start, as long as you do. Congrats. Thank you, Wendy! And that's exactly how I see it. I was just so eager for a start and here it is. Thanks for stopping by! What a great call story. We (TRM girls) never doubted this day would come.